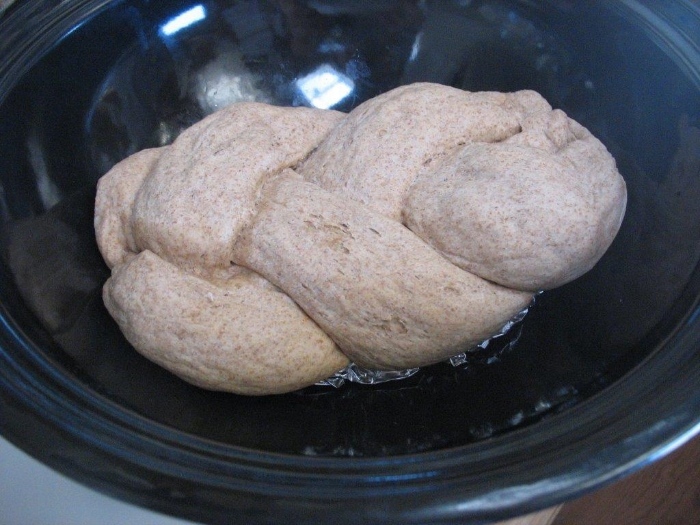 I love Challah (Jewish braided bread) and wanted to see if it would work in the Hot Pot. 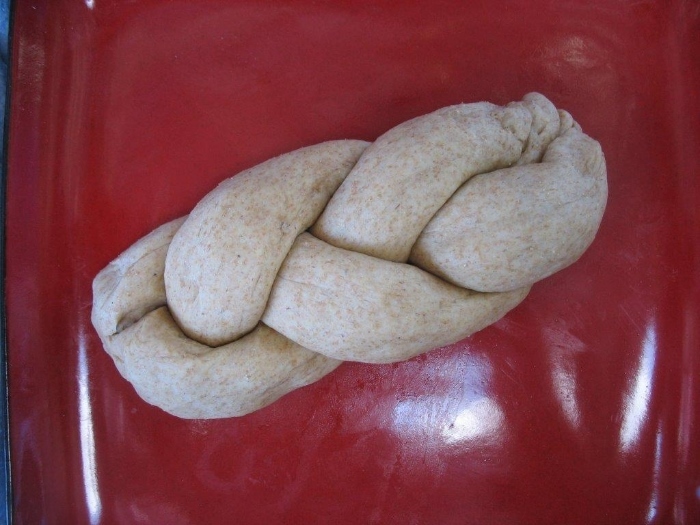 Prep by making the dough, which can then be refrigerated for a day or two and set out early to rise the day you will bake. It will probably take almost twice as long to rise the first time from the fridge, though, depending on the temperature where you set it—maybe up to 3 hours. I’m going to go ahead and give the recipe for a normal loaf; the Hot Pot will bake only 1/2 of this at one time, but the rest of the dough you can bake later or even freeze for up to 3 months and use another time. (Or of course just cut the recipe in half.) Sometime I actually want to do a little loaf in each of our Hot Pots, but today we want the other Hot Pot for Taco Chicken, so I’m going to save the rest of the dough to bake Thursday. 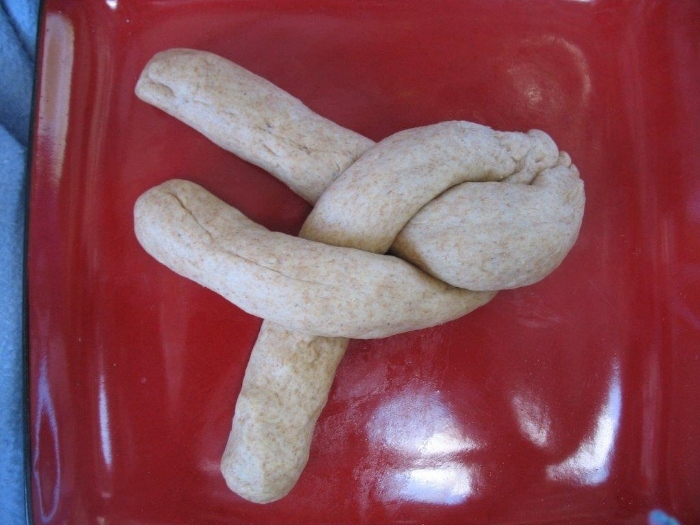 Knead 10 minutes. Cover and put in fridge OR continue with recipe (I’m putting half of my dough in the fridge today). 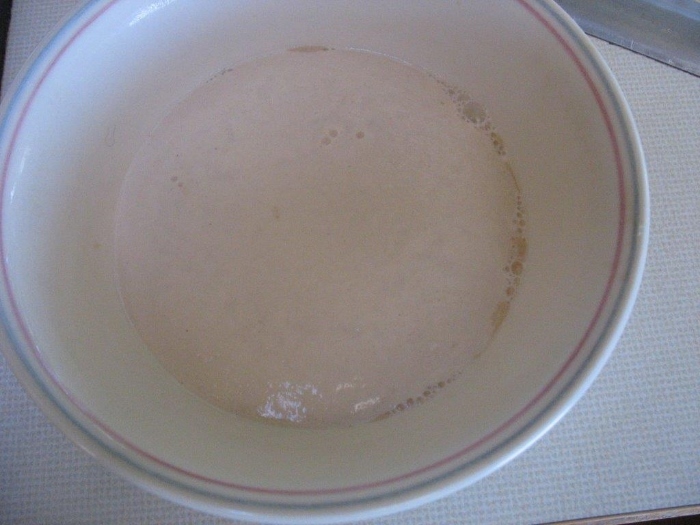 Put in greased bowl, turn to cover dough with oil (or butter). 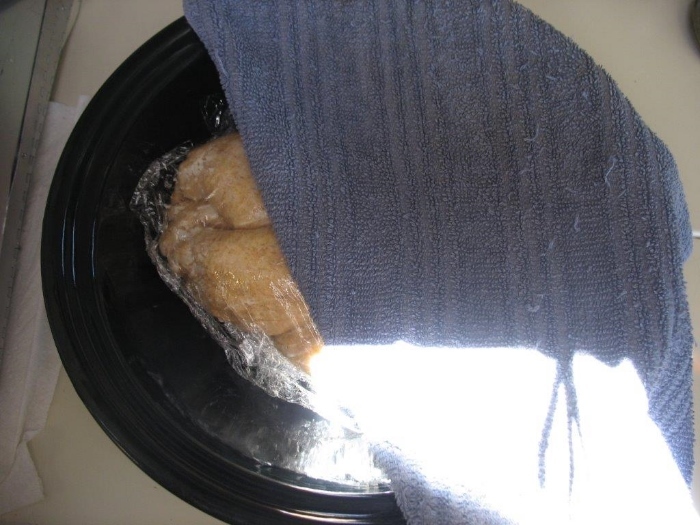 Cover loosely with plastic wrap and a towel and let rise 1 1/2 hours in a warm place. 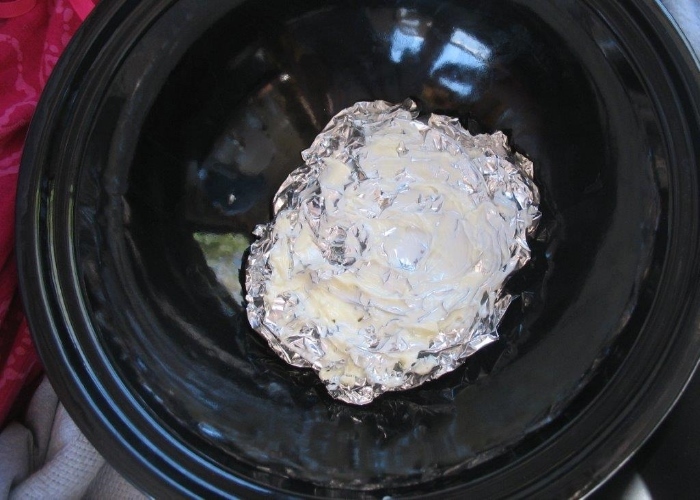 Make a ‘disc’ of foil to set in the bottom of the Hot Pot, thereby making the Pot ‘flat-ish’ on the bottom; heavily grease disc with butter. 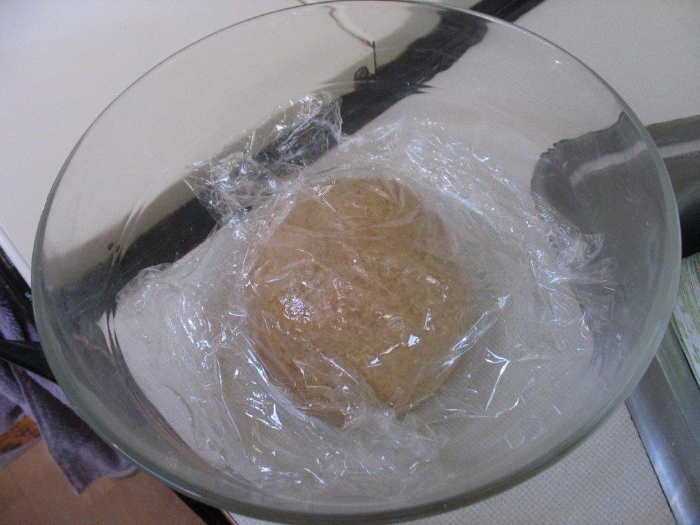 11:30—set dough on buttered disc but do NOT cover with glass lid (only with plastic wrap and a towel). Let rise INDOORS; don’t want the bread to begin baking until it has had a chance to rise first. Set timer for one hour. 12:30—make sure bread has risen, remove plastic wrap and towel, cover with Solar Hot Pot lid, set up Pot facing the sun, set timer for one hour. 1:30—adjust to sun, set timer for one hour. 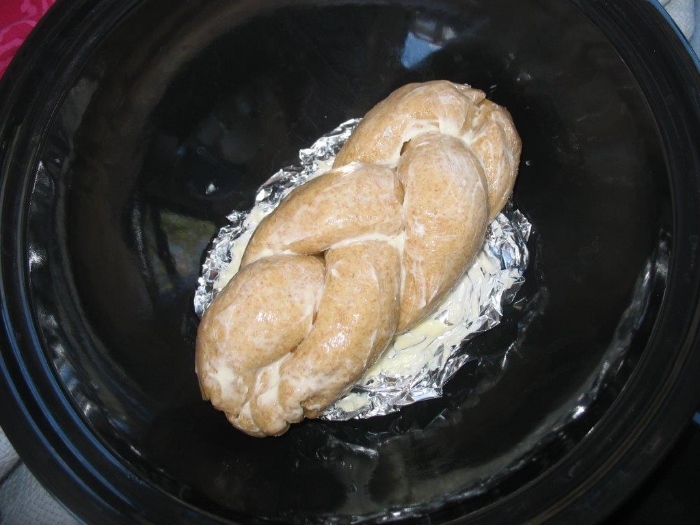 2:30—check bread to see if it is done. Actually, I’m not sure how I’m going to do this until I try.... I’ll come back in a bit and tell you what happens. Later.... When the bread looked dry-ish on the outside (almost exactly 2 hours of baking), I opened the Pot to see how it was doing. When I pressed on it, it seemed firm and done (and it was). The top crust was a little on the dry side (and looked anemic LOL), but the inside texture was nice and moist! The bottom crust was crunchy and good. The loaf was gone in a flash (except a little piece I squirreled away for tomorrow on the road). (smile) Very good snack, warm with butter.